With a myriad of cultures combined in one town, the Caprivi Art Centre is a hub of locally produced art. 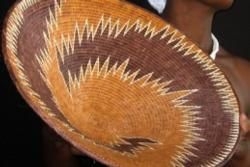 Ranging from beautifully woven baskets, jewelry, pottery, traditional clay ums and incredible wood carvings inspired by the surrounding environment, local artists are given the opportunity to display and sell their wares. Exhibitions and workshops are also held to encourage and develop local talent. The Mashi Crafts Market was an initiative started by 7 women from the Choi area in 1997. With regular orders from the National Art Gallery and an outlet in Windhoek, the market has grown substantially in quantity and quality of goods offered. Located next to the filling station in Kongola, the market displays art in the form of baskets, jewelry, wood carvings and items made from recycled material. 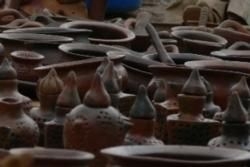 Representing 11 community groups in the Caprivi, the Mashi Crafts Market is well worth the visit.